DALLAS — Carmelo Anthony won’t let his good friend Chris Paul withdrawing from the Olympics impact his decision to play in Rio de Janeiro this summer. The Knicks’ failure to reach the playoffs the last three seasons has Anthony craving team success. The Knicks, who close out a two-game trip against the Mavericks on Wednesday night, have seven games remaining in a season that has been rewarding yet humbling for Anthony. He returned from left knee surgery and is on pace to play 74 games. Anthony changed his game to be more of a facilitator and get his teammates involved, resulting in a career-high 4.2 assists a game. But the Knicks are 30-45 and will miss the playoffs for the third straight season. Anthony, a three-time Olympian and two-time gold medal winner, can’t wait for the Summer Games. Anthony, who will be 32 in two months, wanted to play one last time with Paul and LeBron James, who says he hasn’t decided what he will do this summer. Anthony said he will talk to both of them. Anthony and James could be the first men’s basketball players to win three gold medals. “If we were all going to do it, I would have loved for him being a part of that, especially for this one last time,” Anthony said of Paul. “If CP’s already come out and said that he’s done, then he’s done. Ain’t no convincing him. He gets a little stubborn at times. There’s no convincing him. There have been few positives for the Knicks this season, but one is how Anthony’s knee has held up since his February 2014 surgery. 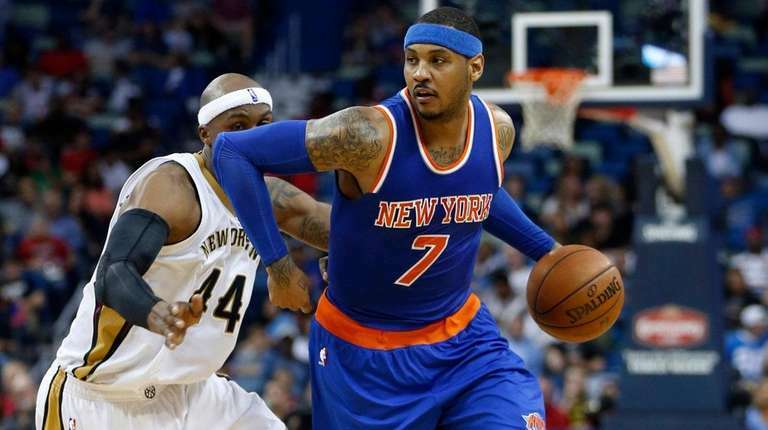 Anthony has missed only three games because of soreness in his left knee. He leads the Knicks in scoring (22.0), rebounds (7.9) and assists (4.2), and feels good knowing that usually players don’t return to 100 percent until one year after surgery. “Mentally this year was kind of get back on the court, get your legs underneath you, get completely healthy,” Anthony said. “I didn’t believe I was going to be full-blown 100 percent and get ready to get back to what I was capable of doing before, [and] as far as being as explosive, it was going to take steps.